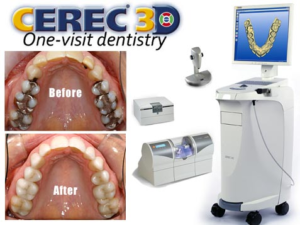 As a certified trainer in CEREC technology, Dr. Mojaver has fully invested herself into learning the absolute best ways to care for your teeth or replace one or more missing teeth with a dental implant and dental crown. At your appointment we use an infrared camera to cast an optical impression of your teeth, without leaving the chalky residue of a traditional mold. Next, our 3D Computer Aided Design (CAD) software designs the ideal shape, look and fit of the new dental crown. Once the strong ceramic crown is formed it is reviewed, adjusted, and then fitted again to your mouth to ensure a perfect fit. Give us a call at 858-513-1747 to schedule your consultation!